There is a surprise hiding in some of your favourite fall foods. Research has found some of our favourite fall foods contain nutrients that can battle some of the greatest health concerns of today. Fresh and delicious, apples are a great food to enjoy this fall. A perfect snack, apples are nutritious, portable and easy to eat anywhere. Small apples are a particularly great snack for kids on the go! Apples are also great in the kitchen – try substituting applesauce for butter in your recipes to create healthier and lighter dishes. RESEARCH: “An apple a day can keep the doctor away” may be an old saying; however, research agrees. Apples contain quercetin, a powerful flavonoid found in the skin of apples and other produce like citrus fruits and onions. Quercetin is an antioxidant – it battles with free radicals to prevent them from damaging cells in your body. Quercetin also regulates inflammation. According to a 2014 study reported in Nutrition Research, quercetin from apples combined with omega-3s from fish effectively lowered markers of inflammation in the body, as well as blood lipid levels. Creamy in texture and radiant in colour, sweet potatoes are not just satisfying to your palate and eyes, they are a great source of vitamin A, vitamin C, and fiber. 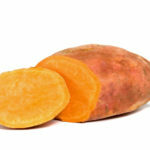 In just one baked sweet potato, you’ll find more than 200 per cent of the recommended daily value of Vitamin A. RESEARCH: Research at the College of Agriculture and Life Sciences at the North Carolina State University has confirmed sweet potatoes are a low-glycemic index food. The researchers discovered the most common variety of sweet potatoes grown in North Carolina, Beauregard, has similar protein patterns to caiapo, a dietary supplement marketed to control blood sugar in the United States. Bake them, stew them, slice and roast them, or add them to a stir-fry – sweet potatoes are a healthy, filling, delicious fall food. Squash is a surprisingly good source of vitamin B6, B2 and folate, along with vitamin A, C and fiber. Try roasting cubes of squash in olive oil and nutmeg until just kissed with brown. Pair squash with chickpeas and curry in a fabulous fall couscous (see recipe below). Ward off the cold with a roasted squash and pear soup. RESEARCH: Squash is also an excellent source of a lesser-known group of nutrients called cucurbitacins. 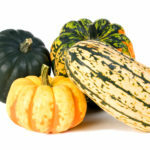 Found in pumpkins, zucchini and squash, cucurbitacins were noted as having potential anticancer abilities in a study published in Current Pharmacological Design in 2012. Rios, JL., et al. Cucurbitacins as inducers of cell death and a rich source of potential anticancer compounds. Curr Pharm Des 2012;18(12):1663-76.